The Artist has been on my radar for a while now. Basically, ever since it swept the top Oscars for 2011: Best Actor, Best Director, and Best Picture. Any film that can do that is worth a watch. It doesn’t matter if it ends up as your favorite or not; if you’re a movie buff you had best see it. So when I set up the new ‘You vote, I review!’ segment of my blog, one movie had to be the first choice. And, apparently, a lot of other people want to see it too, because it won hands down. So, you voted, and now I’m reviewing. Enjoy. As you most likely know, The Artist is a silent film. It is a silent film about silent films. And it’s silent star stars in silent films until they are silenced by talkies. 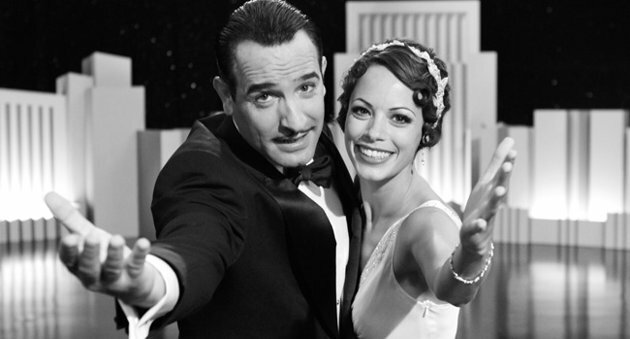 Dujardin plays George Valentin, and aging actor who can’t keep up with the times. When his career is threatened by a new form of cinema, he must adapt or be forgotten. Trouble is, his new competition is non other than the beautiful girl whose career he began, and who’s face he cannot forget. I was completely surprised by this film. I assumed it was good, and I knew it was silent, but I didn’t know how good silence could be. Without unneeded dialogue, the actors were able to show true emotion through simple facial changes, to portray a depth that the greatest script would have a difficult time conveying. Part homage to silent films, part critique of modern films, and part pure engaging story, this is a movie that deserves the praise it gets. My only criticism would be that it’s a little too similar to Singing in the Rain, which was itself a story about the end of the silent film era. The Artist may borrow from that amazing film, and I might recommend watching it first, but that fact doesn’t detract from just how enjoyable, captivating, and wonderfully refreshing I found this film to be. You voted, I reviewed, and I thank you for choosing such an excellent movie.